It’s easy to see why the Shakers called their village the “City of Peace.” We’re a welcome retreat from today’s hectic pace. Farming was at the heart of all Shaker communities. Through agricultural experimentation and wise use of technology, the Shakers made their farms into models of efficiency and innovation. Hancock Shaker Village is still a working farm today, with vegetables, herbs and a barn full of livestock. In spring, the herb and vegetable gardens come to life, first with strawberry and asparagus, then with thyme, sage and the other distinctive plants grown by the Shakers. In fall, our gardeners collect seeds from these heirloom varieties as part of our ongoing conservation efforts. Heirloom vegetable gardens are planted and tended using techniques from the 1843 Shaker “Gardener’s Manual.” Varieties are based on Shaker seed lists from the 1800s, many of which are rare and difficult to find today. Mangel Wurtzel Beets, Early White Turnip Radish, and Large White Marrowfat Peas illustrate the types grown by the Shakers in the 19th Century for culinary use, for sale to the community, and for animal fodder. Our friendly gardeners are happy to answer your questions as they work, so don’t be shy. We also offer special garden tours for groups by advance reservation. Click on Shaker Adventures to learn more. Heritage livestock populate our fields and barnyard with sheep, pigs, cattle, and poultry breeds representative of those kept by the Shakers. Be sure to visit the barns for an up-close look. Hancock Shaker Village is among eight featured gardens in Gardens of the Berkshires. Click for more information. In their quest to live in a heaven on earth, the Shakers created a distinctive material world. Unique dwellings housed men and women whose labors produced the furniture, textiles, and agricultural and household equipment in what we now call Shaker style. Spared from the ornamentation seen in worldly goods, the objects made by Shaker hands exhibit clean lines and functional grace. 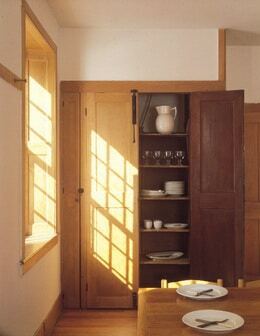 The beauty of Shaker style resides in its purity of design. Fifty room-setting exhibitions are offered within the Village. These exhibitions accent the full range of Shaker daily life and show the Village’s collection as the Shakers would have used it. In the Brick Dwelling, you will see an infirmary with hospital beds, adults’ cradles and 19th-century medical equipment. In the Sisters’ Dairy and Weave Loft, you will see looms, spinning wheels and butter churns. As you explore the Village’s buildings you will see the premier collection of Shaker furniture, crafts and tools. You will see traditional Shaker design – oval boxes, peg rails, quintessential Shaker chairs. You will also see things that surprise you – brightly painted furniture, a delicate child’s high chair. Room settings within the Village’s historic buildings allow you to gain a deeper understanding of the role these objects played in the daily life of the Shakers. Share your love of history, agriculture and design with your children or grandchildren as our costumed interpreters engage them in a variety of activities. The Village’s 750 acres provide a delightful outdoor classroom and lots of fresh air! The Discovery Barn in the 1910 Barn is our hands-on center where children can spin wool, construct a Shaker chair, or weave on a loom that’s sized just for them. Farm activities include watching baby chicks hatch or milking Mary Jane, a life-size replica of a Holstein cow. Try-on Shaker-stye clothing! Discovery Room interpreters are happy to take a memorable portrait of you in your new garb. Learn to spell with letter boards, write with a quill pen, and receive instruction on how to behave like a good Shaker boy or girl in the Schoolhouse, where children can take a 19th-century school lesson from a costumed Shaker teacher. The farm and gardens are always a favorite place for families. Children delight in seeing all the animals and their babies. The Village keeps heritage breeds of sheep, cows, goats, chickens, turkeys and pigs. Hiking our trails is a great way to see Hancock Shaker Village from another vantage point! Discover our Shaker legacy along trails which pass bygone building sites and gathering places while enjoying the scenic beauty of the Berkshires. Please check in at our Ticket Desk for your trail map and sticker. Well-marked trails start on the North side of Route 20, continue past the Shaker Reservoir, the site of the North Family and on to Mt. Sinai, the Shakers’ most spiritual place. This hike takes about 3 hours, up and back. Admission to the Village is not required in order to hike on the North side of Route 20. Our trails link with those of Pittsfield State Forest, for those who would like a longer hike. Please note that trails beyond Mt. Sinai are difficult due to the ice storm last winter. Signage is being restored, but caution is advised. There are occasional guided hikes to Mt. Sinai, as well. Please call (413) 443-0188 for more information on registration and fees. On the South side of Route 20, our Farm and Forest Trail is a handicapped accessible loop going through pastures and wooded lands behind the Round Stone Barn. You’ll find interesting signage along the way, describing the Shakers’ use of this land. This half-hour hike is not difficult and is included in admission to the Village. Our beautifully restored and walkable Village is set amid acres of farm, woodland and pasture. The world-famous Round Stone Barn is a testament to Shaker efficiency, innovation and design. Experience life as a Shaker with a visit to the “Please Touch” Room (Room # 6) in the Brick Dwelling.